The archery range at Blackwell has three separate ranges, each with posted regulations, bow racks, quivers and limestone shooting lines. Each of the three ranges have bow racks, quivers and limestone shooting lines with overshot and clear zones. 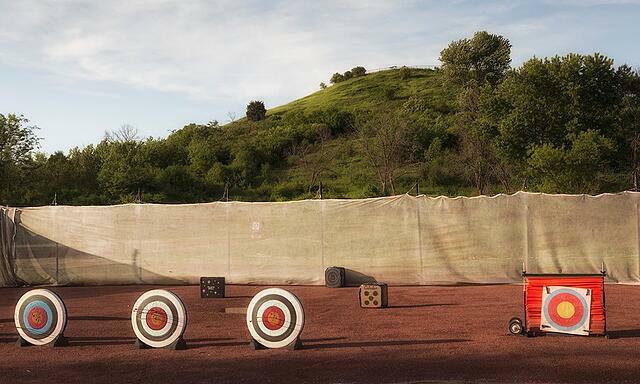 We provide a limited number of targets for the three ranges and encourage archers to bring their own targets. The beginner range is enclosed on three sides with safety netting and features standard targets up to 25 yards. It is open March – Nov. 15. The advanced range is marked in meters and features targets up to 90 meters. It is open year-round. The interactive range is marked in yards and features targets up to 60 yards. It is open March – Nov. 15. Starting June 1, 2019, you’ll need to have a permit to use the range. Permits will go on sale May 1, and senior citizens, active U.S. military personnel and honorably discharged U.S. military veterans will be entitled to one free annual permit per calendar year. Annual permits are for the calendar year January – December. Annual permits purchased in 2019 are valid through 2020. For the safety of our archers and other forest preserve patrons, crossbows are not allowed at the archery range. Arrows with broad heads are also forbidden at the range. Why can't I use a crossbow at the archery range? Crossbow archery is a popular sport and enjoyed by many archers, but Forest Preserve District rangers do not monitor this archery range. The District prohibits the use of crossbows at its archery range in order to ensure a safe and fun experience for all of our forest preserve patrons. Some ranges that allow crossbow archery — although not owned by the Forest Preserve District — are located a few miles from Blackwell Forest Preserve. Archers use this range at their own risk. Why is another visitor able to use a crossbow but I cannot? Permission to use a crossbow is available to an individual who submits a Disability Identification Card certifying that he or she is incapable of drawing any type of bow with a minimum draw weight of 40 pounds. If this applies to you, please submit your paperwork to permits@dupageforest.org to receive the required permission. The advanced range is open year-round; the beginner and intermediate ranges are open March – Nov. 15. The hours for all three are one hour after sunrise until sunset except on Wednesdays, when they open at 10 a.m.
Read our Rules & Regulations. to enjoy the forest preserves! The Forest Preserve District of DuPage County offers scores of nature-related programs and activities for grownups, kids, families and groups year-round. Click below to register for programs, reserve shelters and campsites or purchase permits, and we'll see you soon! Monday – Friday 8 a.m. – 4 p.m.
Help keep our forest preserves beautiful and safe places. If you have a concern, let us know. The Forest Preserve District is committed to making its facilities accessible to all visitors. Contact 630-933-7683 or TTY 800-526-0857.